Much like the HE1000, Hifiman has seen fit to bring out a revised Edition X in the form of the Edition X V2 and in doing so saw to it that my lead up to Xmas 2016 was filled with instant regret at not jumping on an original Edition X V1 review at the start of the year. It is not the fact I am coming at the whole Edition X experience for the first time thus I am not going to be able to qualify the success of the V2 compared to the V1, but rather the fact I actually think the V2 is an absolute joy to listen to. Somehow, in my random nightly discussions, I got it into my head that an Edition X, not being as technically capable as the HE1000, might end up getting a negative slant in any subsequent review. Well, nothing could be further from the truth. The Edition X V2 has its own sound, its own energy and its own usage scenarios that mark it out as a very different experience from the HE1000 V2. The Edition X line is pitched as the efficient mobile version of the HE1000. It is hyper-efficient for an open back planar, even to the point where the V1 distorted on modestly powerful amps. It takes the HE1K technology and form factor, strips it down a bit and targets those who do not want to invest in a quality desktop amp but still want to taste that HE1K sound quality in some way. This is a high-end headphone that you can play with your portable source and get a quality audio reproduction on a different plane to the HE400s which was their most efficient planar previously. What’s Retained From The V1? The core technology stays the same, much like the HE1k V2 shake up the Edition X V2’s ultra-thin diaphragm from the V1 remains intact. Also, the dual sided asymmetrical magnet and window shade design is as before and I think that’s important to retain confidence in those thinking of upgrading that they will get something familiar. Weight wise the V2 is the exact same as the V1 weighing in at 399g. 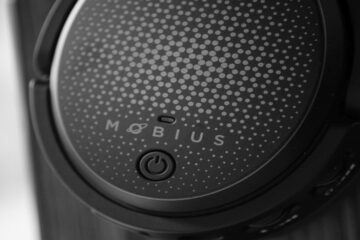 Technical specifications are the same on paper also so it still rated at 25-ohms and 103dB sensitivity which is very efficient for a planar headphone. By all accounts, the Edition X seems to have been well received by the market and the change push and pull factors largely mirror that of the HE1000 V2 with some additional material improvements. In comes the new headband design and adjustment improvements from the HE1K V2, a strengthened yoke made of metal instead of plastic, the same new pleather and polyester beveled pads as the HE1K V2 as well as a new and somewhat bizarre cable design. Hifiman has also seen fit to reimagine the V2 in their more traditional satin black coloring instead of the previous purple hue of the V1. Well, how does $1299 grab you? That’s a $500 drop on the original Edition X price and puts it smack in the middle of a lot of great headphones from the likes of MrSpeakers, Audeze, Sennheiser, and Beyer. The previous $1799 price felt too high for me. It was not a value for money priced on sound quality since I never heard but rather there are a ton of planars coming in at almost 50% off. The higher price felt more like an obstacle than an inducement for high-end listening on the go. Of course, this price drop can work both ways. Those with the original V1 will feel the pinch in resale value and there is no upgrade program on the ED X V2 like the HE1000 V2. I suspect it just isn’t economically viable at 50% of the price of the new V2 to upgrade the V1. If you want a new V2 you will have to buy it outright and expect sub $1k on your old V1 in used condition. On the other hand, something that seemed a little pricey is now much cheaper with the upgrades so if you are a first-time potential buyer the Edition X range just got a whole lot more enticing. 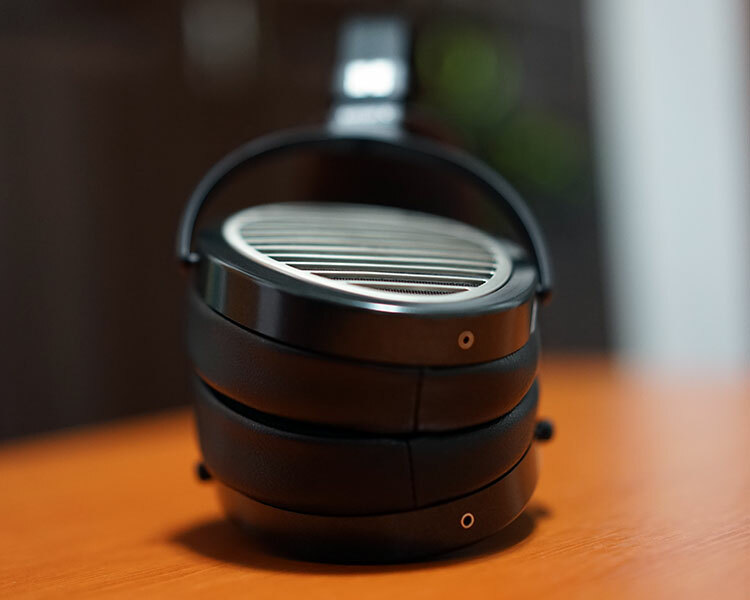 The form factor is the same as the HE1000 series except instead of the HE1K organic color scheme comprising of wood veneer cups and reconstituted leather you have a much darker satin black hard plastic finish with a polyester and foam head strap. It is complimented by continuing that theme right throughout the packaging with a similarly darkened protective case. For all more natural coloring bias I have to say the more traditional black colors often used by Hifiman has always been their most consistent. I certainly prefer this to the more pop art purple hue of the V1 which I felt clashed with the black frame and metal mesh. Now you simply have satin black and a silver alloy cup mesh and ring which looks far more integrated. This was one of the main concerns regarding the build quality of the V1. For a $1799 the plastic gimbal mechanism of the V1 was actually the same material used on the HE400s, HE400i, and HE560. That is a mistake for me. If you price something premium, shifting something from your mid-fi to the top end will be noticed and possibly seen as corner cutting. Sure, you can shift the R&D behind the design but the materials need to reflect the price point so I am glad Hifiman have addressed that issue with a more solid metal gimbal. It certainly feels tougher and more durable than the HE560 yoke and more in keeping with its $1299 price point. If I am not mistaken the Edition X V1 suffered from the same concerns as the HE1000 V1 with regard to the size and shaping of the headband. It all was a bit loose and long. In that respect, the Edition X V2 headband has gone through a very similar change. It is now shorter and squatter with additional adjustment notches to get a better fit for smaller heads as well as reduce some of the downwards pressure of the cups onto the ears. With the V2 the clamp is good and the pressure well distributed. The shorter length combined with the increase in notch adjustment holes also allows the headband leather strap to take a load of the cups downward pressure which in turns allows the sideways clamping pressure to become more effective. Combined with the weight reduction and the comfortable pad materials I would say the comfort rating is close to that of the HE1000 V2 with the bonus of it being slightly lighter. One thing I did note with the slightly thinner strap of the Edition X V2 tended to bring the top of the pads marginally further down compared to the thicker wedge-like leather strap of the HE1K V2. It gave a perception of being slightly longer than the HE1k V2 with my ideal fitting being perhaps 1 notch lower than the headband could offer. The Gimbal screws are tighter also than on the V1, much in the same way as the HE1K V2 screws this gives an additional solidity to the frame rather than that flyaway feel I had with the HE1K V1 cups. The twist and fold flat mechanism of the Ed X V2 now operates in much the same way with similar levels of resistance as the HE1000 V2 design which is a good thing. For those coming from the HE1000 series the actual metal arch of the headband is a thinner metal grade so not quite as durable as the solid silver-colored alloy of its bigger sibling, more on par with the HE400/560 metal banding with the plastic binding and motif just at the base. The strap is made of a polyester and synthetic type material with a thin wedge of cushioning inside. It is slightly thinner than the higher grade leather of the HE1000 V2. The original V1’s ultra pads were the same as the HE1K V1 pads so they too have gone through a similar upgrade both in terms of material uses and their form factor. The original pads were more premium versions of the Focus pads used on the HE400i and HE560 headphones called the Ultra Pads. Essentially, they were a mix of velour and leather and seen as offering a solid combination of the audible qualities of both materials and also reasonably comfortable. They also offered a nice balance between seal and heat dissipation. The new V2 Ultra Pads are now thicker than the originals with a wider angle ‘wedge type’ form factor that should follow the typical contours of most people’s heads and provide a more comfortable fit and a superior seal. They are still not as thick and luxurious as the MrSpeakers Ether or Audeze LCD series pads but they so have a more defined and noticeable wedge than before. Gone also is the velour surface finish of the original Ultra Pads and in comes the new polyester type material found on the HE1000 V2 pads. Hifiman claims that the new polyester material does have audible improvements over the original velour design with an enhanced level of transparency in the presentation. They remain detachable in design so if they are not to your liking you can swap them out for the older pads or the plethora of modded aftermarket pads depending on your preferences. As per the V1, you get two types of cables in the box. The first is short 1.5m cable terminated in a fairly hefty and attractive looking 3.5mm right angle jack on one end and some dashing silver accented metal stereo 2.5mm jacks on the other. The silver finishing on the jacks really stand out and personally would have loved to have seen these on the HE1000 V2 cables rather than the standard black colored jacks. 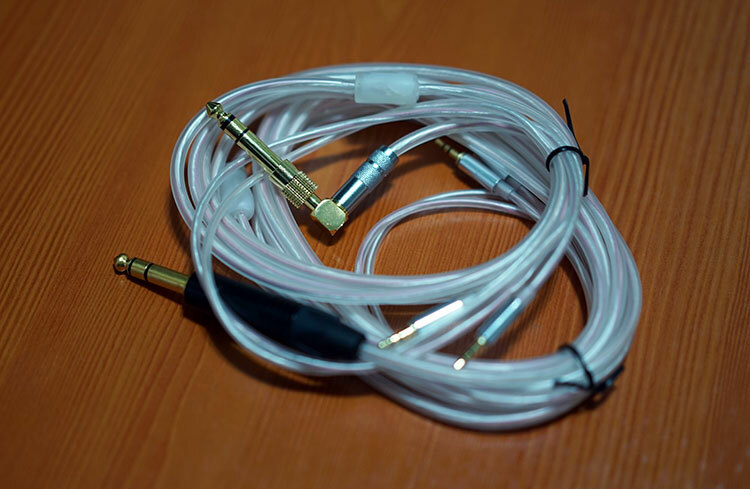 Hifiman has also seen fit to throw in a gold-plated quarter jack accessory for the 1.5m cable. The second is a more standard 3m desktop version with a quarter jack termination and the same accented silver metal 2.5mm stereo jacks for connecting to the cups. There is no third balanced version such as you would find with the HE1000 series. A couple of reasons I presume based on cost and the fact Fang really doesn’t think the Edition X needs a dedicated amp never mind a balanced amp. They look bizarre, though and even more of a curiosity than the HE1K V2 cables. Visually it just doesn’t mesh with the HE Edition X V2 black and silver visual vibe. They are also a devil to manage with a very flyaway bouncy nature, especially in the short 1.5m version. They seem to have a life of its own. In fact, ‘life’ is an apt descriptive term here because they do come across as something that should really go into your vein than the headphones given its silicone outer coating consistency and clear transparent appearance. All of this fits neatly into the retail packaging which is pretty much the same as the V1 only this time the matching black and charcoal gray scheme seems to blend in better with the similar color scheme of the headphone itself, i.e. no more purple. Mind you, even more than the HE1000 V2, the Edition X V2 needs a carry case. This is being marketed as a headphone for portable sources and DAPs it stands to reason people will want to bring their V2 with them. An optional carry case such as the Audeze hard case would be a highly desirable secondary purchase. The HE1000 V2 has the greater technical capability, let’s put that to bed right away, but for me, the tonal presentation of the Edition X V2 is the more endearing and easier to get into from the get go. I remember speaking to Hifiman’s PR team and simply stating “wow” this is awesome like some sort of a noob. Surprises like this are what it’s all about and what makes this business so much fun. You can almost call it a very gentle u-shape but it is very marginal that you could argue that it is more neutral than anything but that only tells half the story. For me, the V2 is very balanced with a linear and accurate low end right up to around 1k, a rich and flowing mid-range that I did not expect and a treble performance with some nice sparkle around 6-7k and again just after the 11-12k marker giving it a subtle “hi-fi” sound and decent air to its presentation. Staging is more tall than deep but the open and airy nature of the V2 keeps it sounding relatively spacious with decent width. It’s more natural sounding with a neutral position than intimate or arena-like. I simply can’t foresee anyone suffering from matching issues with the V2 and any sort of creeping fatigue. There is nothing strident or brash about the V2 signature yet it has a nice undercurrent of engaging energy to keep it from sounding sterile or analytical. If you want to term the presentation as musical I can get down with that though personally, I find the term “pleasing” to be more suitable. I really admire the discipline and control Hifiman have engineered into the V2’s bass performance. This is a flat but very natural sounding bass response with a lovely balance in note quality between attack and decay. The quantity and quality are remarkably consistent and accurate sounding right down to around 20-30hz with nothing really in the way of a perceptible roll off or an uneven mid-bass bias. By all accounts (aural memory in some respects) sub-bass performance has improved from the more rolled-off low-end response of the V1. Certainly, I do not find the V2 bass lacking in texture and detail, in fact, the articulation and detail are excellent. Bass fundamentals are spot on with the V2 and helped tremendously by a very natural instrumental timbre allowing lower register string plucks to register with some excellent authority. Much like the V1, there is a tiny dip from 1-2k then an elevated vocal and upper mid-range presence. The key difference this time the V2 has just that bit more elevation making it sound much less muted and soft sounding than the V1. This is a more powerful and forward sounding response particularly in the vocal performance where sibilance control is superb on both male and female vocals. The net result is a rich and smooth sounding mid-range with a wonderfully enticing instrumental timbre and a vocal performance that is very solid in texture and detail. It is a very different mid-range to the HE1K V2 despite it probably being a little more energetic and forward than their V1 counterparts. The HE1K mid-range is vivid, lifelike and very clean. I call it an attention grabber of sorts. The Edition X V2 mid-range is more laid back, a little smoothed over in detail by comparison but richer and more forgiving. An astute quality to throw in given its level of efficiency and clear pitch to portable source users. The V2’s treble has a touch more energy and sparkle than the previous version though in absolute context it is not a brash forward performance with just the right amount of elevation from 6-9k and once again around 11-12k. Unlike the V1 the roll off post 8k is not quite as steep with that mini peak post 10k keeping it from sounding shelved down or lacking in air. As a result, the top end of the V2 will come off sounding more extended with more snap and energy in its lower to mid-treble response, particularly on higher pitched percussion and cymbal work where you will find a bit more emphasis. 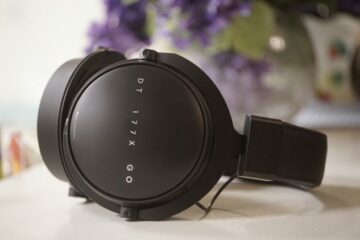 Those coming from the HE1000 V1 or V2 will find the treble performance of the Edition X V2 instantly more forgiving and more flexible by comparison. You won’t get the absolute extension and level of detail but neither will you be system matching as much nor will genre selection play that much of a role in how the treble of the Edition X V2 performs. Some sources will tweak with the top end a little. DAPs such as the AK380 will give it a more natural and slightly warmer sheen whereas others such as the Paw Gold might be a bit cleaner and brighter but otherwise the Edition X V2 treble stays fairly smooth. Hello. I have a Hifiman HM-650 with the minibox gold card, which I just ordered. I like the reviews I’ve been reading. Here’s what headphones I already own. The Hifiman HE-400i, Ultrasone’s Pro 650’s, 900’s and Performance 880’s. I’m wondering should I sell all of these headphones? Yes, sell them all, you won’t regret it. Ok. Thank you. Good to know and will do. Hey Marcus, I bought the HEX V2 based on your recommendation and I’m absoloutely loving these. However my AK300 does not provide enough power for these especially in DSD files. I’m trying to decide between Mojo or iFi Micro BL for a transportable setup, which one do you recommend to get a little bit more sparkle out of these? I would go with the Mojo to be honest though I have a soft spot for the cheaper Nano iDSD BL which I think tonally might be a really nice pairing. The Mojo will have more power though. How would you compare these to Audeze’s LCD-X? They are both quite efficient and priced the same now. I really can’t decide between them. The Edition X V2 is much more efficient, lighter and comfier to wear. This is the headphone that will run nicely on a regular DAP. The LCD-X requires a lot more power, much heavier to wear and is more desktop orientated. Tonally the V2 is a bit more musical and the X a little cleaner and more balanced sounding. The X is perhaps the most “neutral” of the LCD lineup outside of the 4 but still more physical sounding and a bit more expansive than the V2. The V2 is more euphoric in its timbre, perhaps more mid-bass wamth though slightly less resolving. First I read that the Edition X V2 comes only with an unbalanced cable (“because Fang really doesn’t think the Edition X needs a dedicated dedicated amp never mind a balanced amp.”). Then, in the section “Balanced For The Win!” the headphone miraculously transforms into a 4-pole balanced cable. Please explain exactly what you did to make it a balanced cable as I am considering driving it (unpurchased as yet) from the 2.5 mm balanced output of AMP1 on my iBasso DX200. Ah sorry nothing magical Andrew, I simply used the balanced one that came with the Hifiman HE1000 V2 but you can buy a balanced version of their cable on their main website. 6Vrms out of the DX200 balanced should do the trick! Solved! All the time I was under the impression that the headphone comes with a lead that you have to interface to. Instead the female sockets are built into the ear-pieces themselves, thus no cable is attached to the headphone itself. Marvellous idea! I will say I am proud to be a new owner of the HEX V2! 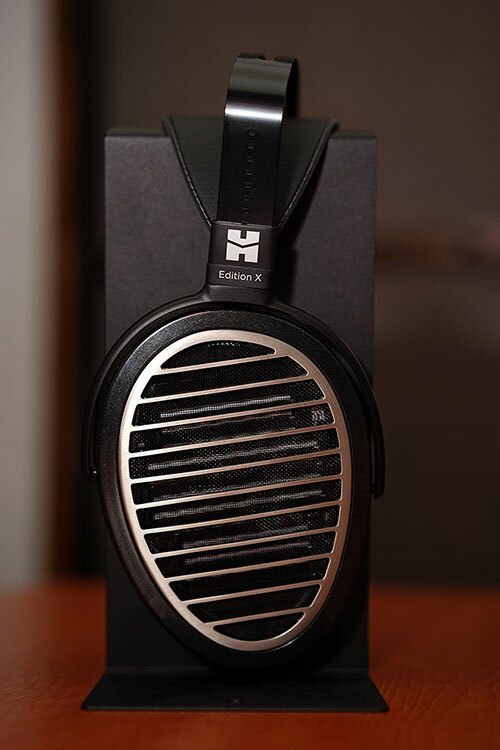 After demoing the majority of the headphones in the $1000-$2000 bracket, the HEX just stood out fairly easily for me. It was the sound signature I was specifically looking for. More people need to buy these. They are just something special. It is a funny thing – the HE1000 V2 is leaps and bounds the more resolving headphone but there is something that makes me keep pulling out the EDX V2 every night for a casual listening session. Good choice! How would these compare to the HE-6? Very different headphones in many respects. You need a powerful amp to get the best out of the dual planar HE6 which is very inefficient and you can run the Edition X of a decent DAP its that efficient. Ah, I was just wondering. Heard many saying the HE-6 is still a better headphone if you can drive it properly. 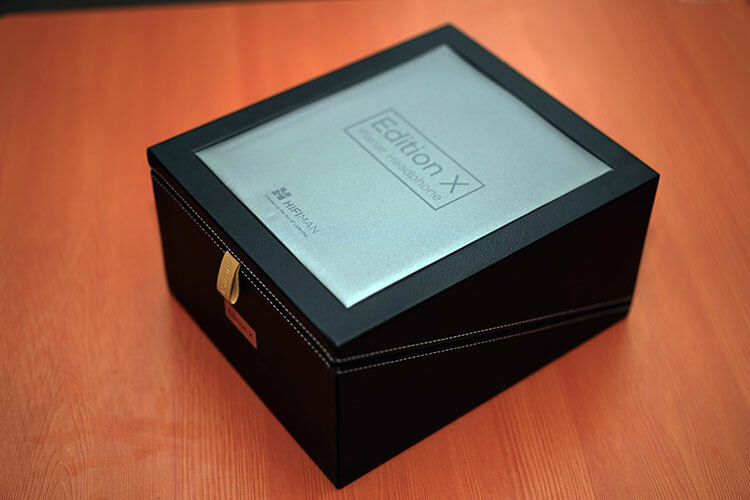 Yes it is, though some people will enjoy the warmer more forgiving coloration of the Edition X V2. However, on dynamics, extension, and detail the HE6 sings beautifully with a well-powered amp. I’m very curious as to how these compare to the Focal Elear! Any notes? Sadly no Elear available when testing, might be able to comment on this in the new year.